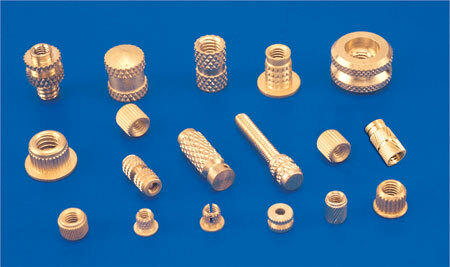 Specials We shall be pleased to develop Non-Standard threaded Brass molding inserts as per specific requirements. Finish Brass natural | Nickel etc. Threads ISO Metric | BSW | BA | BSPT BSP NPT NPTF BSF | UNC | UNF etc. Features : They are one throw' hole Brass inserts. They can be potted in or molded. A straight knurl offers better torque out capabilities. Features : They are compact inserts suitable for insertion in all types of plastics and can be used with hot plastic Molding and cold plastic molding . Inserts are best suitable for electrical molded box application. Sizes : from 2mm -12mm and 1/8" - 1/2"
Features : These Brass inserts are used for UPVC molding CPVC molding for sewerage and daring pipe fittings elbows and Pipe couplings . Features : These Brass inserts are push fit type and are used with Wood and plastic molding. . Features : These inserts are suitable for installation with wide range of thermoplastics and are sued where high pull out torque is required. 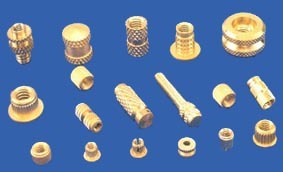 Features : These screws are used for molding of Nylon spacers and pillars. Sizes : from 2mm-10mm and 1/8"-3/8"